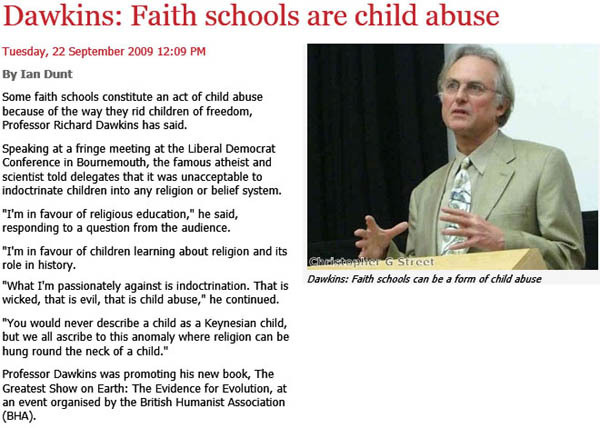 Professor Richard Dawkins has said that he considers Faith Schools to be child abuse. Here at Ex-Christadelphians we agree and we believe that for the well being of the students they should be opposed. We do not object to Church owned schools. My own three children attend a great Uniting Church owned school, Haileybury College. There they receive a well balanced education free from religious proselyting. We do object to extreme Faith Schools like Heritage Colleges, where preaching to the children is a declared intention of the school. That is quite different to religious education. We think that public money should NOT be spent converting children to a religious sect. Richard's video "The Faith School Menace" can be viewed at the bottom of this page. The argument revolves around whether it is morally defensible to indoctrinate young minds into a religious faith. There are estimated to be approximately ten thousand different religious faiths in the World, with the Christadelphians being a decidedly minor player. The great majority of Christadelphian converts come from children of Christadelphian families, because the religion is such that very few sensible people outside the faith would ever want to join. ﻿Therefore the indoctrination of young, minds is important to Christadelphians to prevent their religion vanishing. I speak from personal experience because I come from a strong Christadelphian family and like most Christadelphian children I was brainwashed into the faith from young age. It took me thirty five painful years before I escaped and freed my mind from Christadelphian thinking. No preaching to students here! My three youngest children attend a great Church Owned School (Haileybury College) free from religious dogma, where they learn about all religions and are free to make up their own minds. Haileybury teachers would never think of preaching to children. They would know that it is wrong. If they tried to preach in school I would guess that they would be dismissed . My children are genuinely free. Children with an imprinted faith are not free. They have been cruelly prejudiced in favour of one brand of religion and psychologically they are trapped. This is not healthy for children. Christadelphians claim that their children are also free to make up their own minds. This is not true; because family religions of all types are imprinted on young minds and it is rare for anyone to leave a family faith. "Indelibly educate them for ever." - What about the children's rights? "Not just to educate students for life, but to INDELIBLY EDUCATE THEM FOR EVER." What do they mean by that statement? I use the word "brainwash" and the Christadelphians use the phrase "Indelibly educate for ever." That's what they do to children in North Korea. They indelibly imprint them with political ideology. Are they telling us that they intend to INDELIBLY inculcate Christadelphian values and beliefs into these children? But what if society does not agree with those values and beliefs? 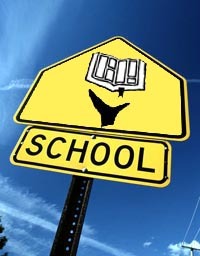 Education should never be "Indelibly" seared into any one's brain. The possible implications of that are sinister. Young children need to grow up free from racial, political and religious prejudice. They should be free to form their own opinions and judgements about social issues. Schools run by cults and sects cannot encourage this freedom of thought. By definition they seek to inculcate a particular worldview into the minds of the youngsters and by and large they succeed. 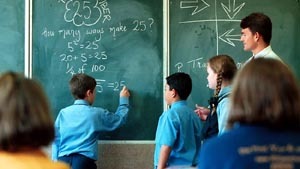 Christadelphians who home-school their children are even worse in my opinion and demonstrate a worrying paranoia about normal society that should not be prejudiced into the minds of their children. Note the use of the adjective "strong." These religious indoctrinators know the power of what they are doing to the kids in their care. It's not just indoctrination, it's "strong" indoctrination. As a Christadelphian child I knew exactly how strong that indoctrination as I was conditioned into Christadelphian thinking. ﻿Note that "Preaching the Gospel" is their primary motivation, not the education of the children. Education is thrown in as an afterthought: "...as well as providing an excellent education." In my view this is a violation of children's human rights. "....largely free from the humanistic influences of modern education systems." How can they teach the State Wide Curriculum (as they are obliged) if they oppose modern educational systems? Australian State Wide Curriculum ARE humanistic and NOT religious. If they are taking public money to run their schools they should stick to the designated curriculum and not pretend that Christadelphians can do as they like. In society humanism, or to be humanistic, or a humanitarian, is considered to be an admirable quality; something to be encouraged in students. But by the logic of Christadelphianism, humans are considered to be sinful. So "humanistic" is hurled around as an insult to the rest of us and their children are taught not to be humanists. Instead they are taught to be Christadelphians. Are Heritage Colleges Teaching A Skewed Curriculum? 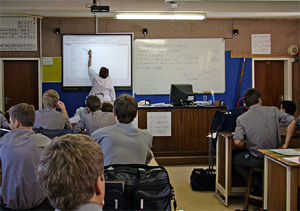 In New South Wales the teaching of Evolution in all schools is mandatory under the State Wide Curriculum. But I have been reliably informed that when Evolution is taught in the Sydney Heritage College, the teachers also teach the Christadelphian belief of Creation. They explain that this is their "own opinion" but nevertheless it is done in science classes in school time. Teaching children the teacher's "opinion" about Creation" in class time is teaching Creation in the classroom. Let's not play with words here. Let's have some honesty in this debate. That is the equivalent of teaching a Geo-centric Universe, a solid firmament in the sky, that the Earth is older than the Universe, the extremely young age of life on Earth, a six thousand year old origin for homo sapiens, demonic possession and Flat Earth Theory in science classes. All of these things are mentioned in the Bible. Young minds cannot clearly distinguish between what is or is not the opinion of a teacher, even if it is clearly stated by the teacher. They may come away from Heritage College science classes confused. They might even suffer poor marks in State final examinations if they introduce Creation or any other Biblical error into their answers. 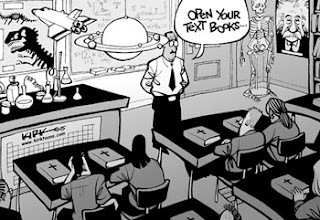 Creation is NOT part of the State Wide Curriculum and teachers should not be wasting school class time trying to persuade their students into believing obsolete science that was debunked over a century ago. I assume that the students at Heritage Colleges are not being told that this is the proposed end result of believing the Gospel as taught by the Christadelphians. Why not? 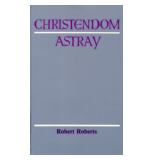 If a Heritage College has Wi Fi, there is nothing to stop children accessing this Christadelphian book online and discovering what their religious teachers' faith is proposing for their future. If any Heritage students are reading this, I encourage you to Click here and read the entire chapter 15 of this disgusting book. Then tell your parents and all your friends about this Christadelphian proposed killing of the peoples of our World when Christ returns. Then demand to leave your school and move to a normal school where the owners don't belong to a religion that advocates the murder of unbelievers in God's Kingdom. Yes, I know that's not what you are being taught at Heritage College. But read it for yourselves and draw your own conclusions. 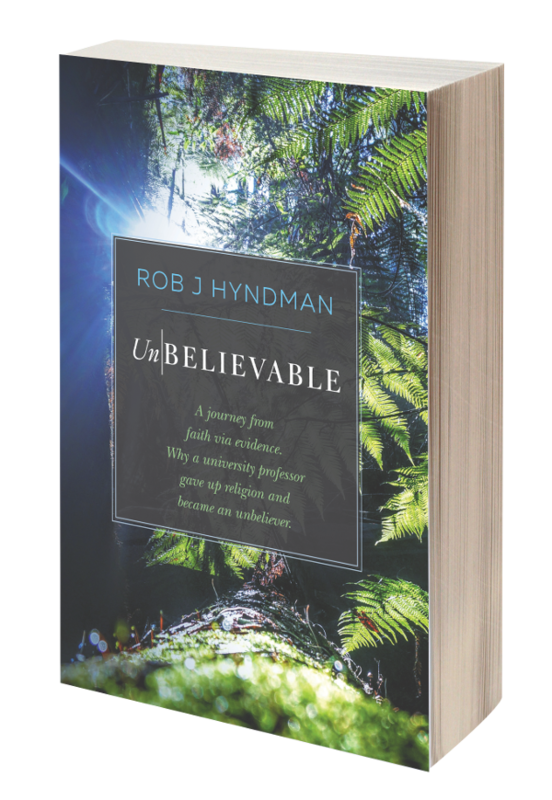 Are you being fooled by your Christadelphian teachers? Do they have a hidden agenda that is not being told to you? The Christadelphian reply may be that they will be "doing God's will." That tells you what sort of genocidal God they serve. If they tell you "Oh we don't believe that any more" ask them how you can trust anything else they are telling you if they changed their minds about the mass murder idea. Ask them why they are still selling that evil book and even offering it available free of charge on the Internet! Concerned parents of students at Christadelphian Heritage Colleges are welcome to contact us for further information and hand-out sheets. Send us an email and we can give you a telephone contact number to call if you need to discuss. Someone needs to start the debate in the Christadelphians about the wisdom of these Christadelphian Heritage Colleges. Someone needs to stand up for the children's rights to a prejudice free education. Free from religious prejudice and free from racial prejudice. Free from all forms of adult prejudice being "indelibly educated" into impressionable minds. It's not good enough to say "The students can make up their own minds when they are older." That is not true. Religious prejudice is extremely hard to overcome when people are older and this explains why the overwhelming majority of people in the World remain in their family religion for life. I believe that this sort of thing is an abuse of children's human rights. We Ex-Christadelphians love humanity. We rejoice in the brilliance of humans, despite their weaknesses and flaws. We are humanitarians and we are proud of and we love humanity. We agree with Professor Dawkins and we oppose the menace of all Faith Schools. We agree with John Fleming that these schools are most worrying. It is our opinion that the abuse of innocent, vulnerable children's minds and the abuse of their human right to a prejudice free education is wrong. We are concerned by Faith Schools that may use education as a cover to instill their own religious prejudice into young minds. Actually, growing up at this school I have never felt "brainwashed." The religious element is more of a code of morals for the school than a way to indoctrinate children. Heck, I know that everyone in my class, and in various other classes around my year level, doubted our faith at least once. We have all been given a chance to not follow the Christadelphian faith, but we all chose to follow it anyway. "We have all been given a chance to not follow the Christadelphian faith"
Do you really think you've been given the same chance "not to follow the Christadelphian faith" as someone who, say, was not raised as a Christadelphian? You seem genuine and I accept that many Christadelphian families (including my own) would have still treated their kids well if they chose another path, but I do wonder if you underestimate the extent to which one's upbringing influences (or even determines) one's path. You know, "Train up a child in the way that he should go..." etc. The choice to leave or stay are not evenly weighted. One option has the full support of your community, family and friends, while the other you likely face alone, and often with very little cultural preparation. And why would you want to leave when even your desires have been shaped by the community that wants you to stay. In my own case I would say that I did "choose" to follow the Christadelphian path in my teens and early adult years, but I made that choice based on a very biased and ill-informed view of the world, which I had inherited from the Christadelphian culture I grew up in. In other words, I made a choice, but it was based on faulty and insufficient information. "Choice." Everything around the Christadelphian child, the moral code imposed on him or her, his relatives, the literature made available, the mandatory church attendance, etc., all effectively erode any "freedom of choice and thought." You know that, I know it, and the bird singing in the tree outside your window knows it. In Christadelphianism, unquestioning belief becomes "the new normal" for adherents. Many of them get boxed into the religion and its oppressive requirements. For some, this becomes a damaging trap, not just an irregular lifestyle. This religion utterly wrecked my family: suicides, incurable insanity, self-esteem issues, etc. It became our prison. And for some of us, it became a death trap. While it pains me to write these things, and while people I love and respect are still in this faith, I will not deny this truth.